Every day, antivirus capabilities in Windows Defender Advanced Threat Protection (Windows Defender ATP) protect millions of customers from threats. To effectively scale protection, Windows Defender ATP uses intelligent systems that combine multiple layers of machine learning models, behavior-based detection algorithms, generics, and heuristics that make a verdict on suspicious files, most of the time in a fraction of a second. 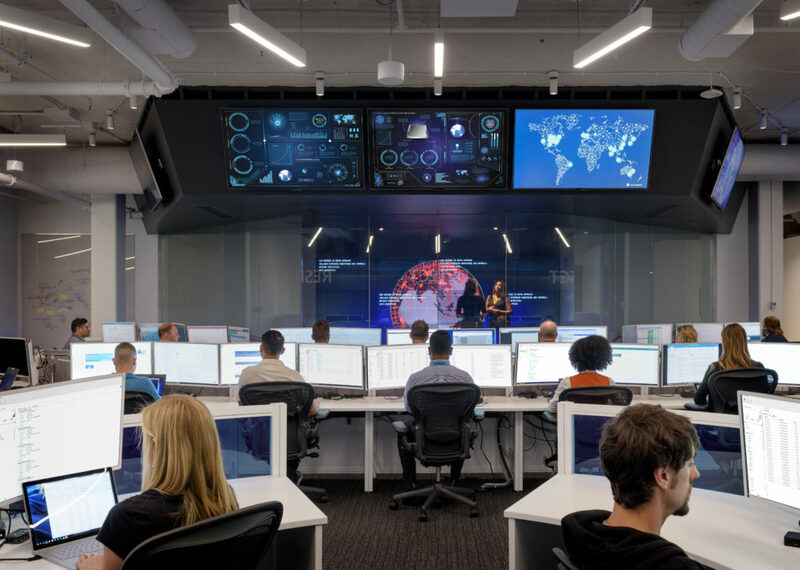 This multilayered approach allows us to proactively protect customers in real-time, whether in the form of stopping massive malware outbreaks or detecting limited sophisticated cyberattacks. This quality of antivirus capabilities is reflected in the consistently high scores that Windows Defender ATP gets in independent tests and the fact that our antivirus solution is the most deployed in the enterprise. The tradeoff of an intelligent, scalable approach is that some of our more aggressive classifiers from time to time misclassify normal files as malicious (false positives). While false positives are a very tiny occurrence compared to the large number of malware we correctly identify (true positives) and protect customers from, we are aware of the impact that misclassified files might have. Keeping false positives at a minimum is an equally important quality metric that we continually work to improve on. Avoiding false positives is a two-way street between security vendors and developers. Publishing apps to the Microsoft Store is the best way for vendors and developers to ensure their programs are not misclassified. For customers, apps from the Microsoft Store are trusted and Microsoft-verified. Here are other ways developers can raise the level of trust by both security vendors and customers and help make sure programs and files are not inadvertently detected as malware. Digital signatures are an important way to ensure the integrity of software. By verifying the identity of the software publisher, a signature assures customers that they know who provided the software they’re installing or running. Digital signatures also assure customers that the software they received is in the same condition as when the publisher signed it and the software has not been tampered with. Code signing does not necessarily guarantee the quality or functionality of software. Digitally signed software can still contain flaws or security vulnerabilities. However, because software vendors’ reputations are based on the quality of their code, there is an incentive to fix these issues. We use the reputation of digital certificates to help determine the reputation of files signed by them. The reverse is also true: we use the reputation of digitally signed files to determine the reputation of the digital certificates they are signed with. One of the most effective ways for developers to reduce the chances of their software being detected as malware is it to digitally sign files with a reputable certificate. The second part of reducing the risk of unintended detection is to build a good reputation on that certificate. Microsoft uses many factors to determine the reputation of a certificate, but the most important are the files that are signed by it. If all the files using a certificate have good reputation and the certificate is valid, then the certificate keeps a good reputation. Extended validation (EV) code signing is a more advanced version of digital certificates and requires a more rigorous vetting and authentication process. This process requires a more comprehensive identity verification and authentication process for each developer. The EV code signing certificates require the use of hardware to sign applications. This hardware requirement is an additional protection against theft or unintended use of code signing certificates. Programs signed by an EV code signing certificate can immediately establish reputation with Windows Defender ATP even if no prior reputation exists for that file or publisher. To gain positive reputation on multiple programs and files, developers sign files with a digital certificate with positive reputation. However, if one of the files gains poor reputation (e.g., detected as malware) or if the certificate was stolen and used to sign malware, then all of the files that are signed with that certificate will inherit the poor reputation. This situation could lead to unintended detection. This framework is implemented this way to prevent the misuse of reputation sharing. We thus advise developers to not share certificates between programs or other developers. This advice particularly holds true for programs that incorporate bundling or use advertising or freemium models of monetization. Reputation accrues—if a software bundler includes components that have poor reputation, the certificate that bundler is signed with gets the poor reputation. 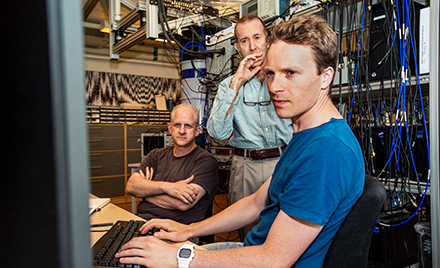 Malware threats use a variety of techniques to hide. Some of these techniques include file obfuscation, being installed in nontraditional install locations, and using names that don’t reflect that purpose of the software. When programs employ malware-like techniques, they trigger flags in our detection algorithms and greatly increase the chances of false positives. Another indicator that can influence the reputation of a file are the other programs the file is associated with. This association can come from what the program installs, what is installed at the same time as the program, or what is seen on the same machines as the file. Not all of these associations directly lead to detections, however, if a program installs other programs or files that have poor reputation, then by association that program gains poor reputation. These evaluation criteria describe the characteristics and behavior of malware and potentially unwanted applications and guide the proper identification of threats. Developers should make sure their programs and files don’t demonstrate undesirable characteristics or behavior to minimize chances of their programs being misclassified. 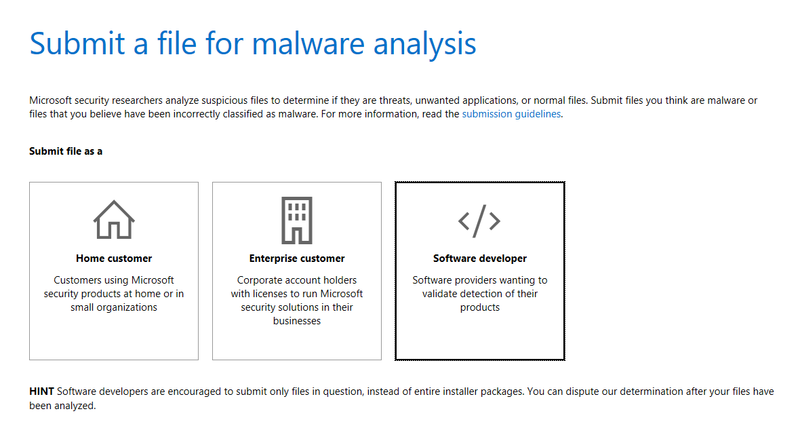 If you follow these pieces of advice and we unintentionally detect your file, you can help us fix the issue by reporting it through the Windows Defender Security Intelligence portal. Customer protection is our top priority. 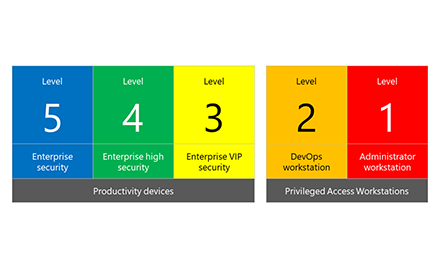 We deliver this through Windows Defender ATP’s unified endpoint security platform. 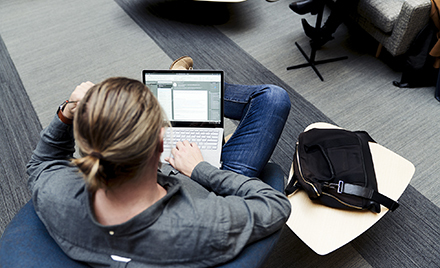 Helping Microsoft maintain high-quality protection benefits customers and developers alike, allowing for an overall productive and secure computing experience.